Down to Earth Clayworks is owned and operated by potter, Brenda Neall. 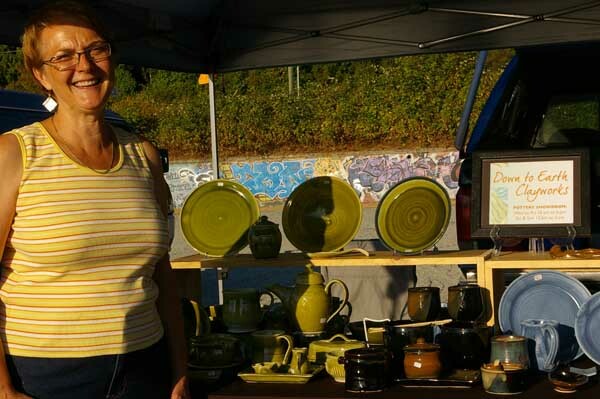 Located in Powell River, BC, Brenda makes hand-crafted, functional pottery, finished with a variety of custom made glazes. Occasionally, ceramic art works such as decorative tiles and tile murals, are also available. Amber Friedman is a fabric artist who studied photography and surface design at the New Brunswick College of Craft and Design in Fredericton, NB. She applies her magical knowledge to fabric, making one of a kind wearable art with intention. A variety of screenprinting and shibori techniques are used to create beautiful tie dyed baby outfits, silk scarves, hand bound books and screenprinted photographs on clothes. 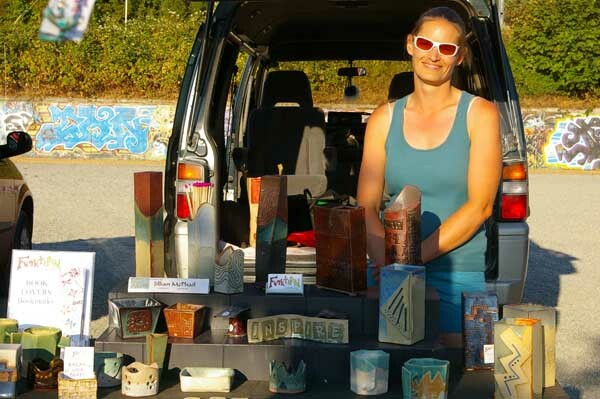 If you miss Amber at the Thursday Night Market you can find her at the Open Air Market on Sundays in Powell River, BC. She loves to do custom magic fabric and teach various dyeing workshops to children and adults. 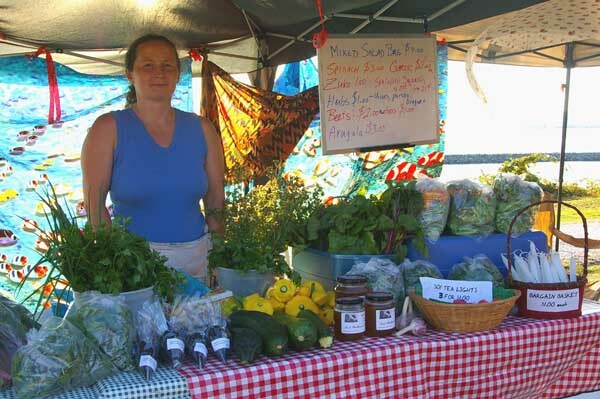 The Lund Farmers C-op is a collection of farmers & market gardeners pooling thier produce together. They focus on organic and natural free range growing. You can buy meat, vegetables, berries & fruit from the co-op depending on what is in season. 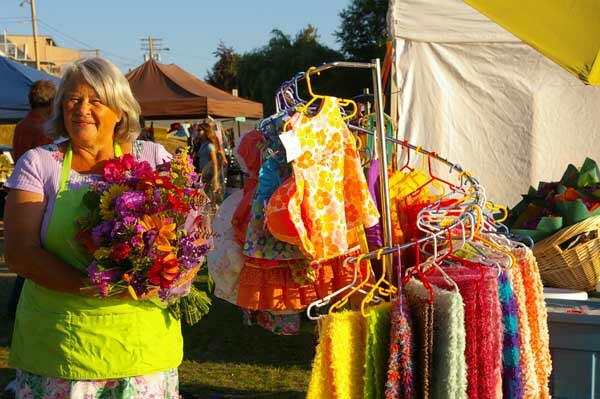 Beautiful fresh flower bouquets, scarves, aprons, childrens clothes, dresses, hats and sweaters. All handmade by Rosie Fleury. A chance pottery class in 2006 opened my eyes up to a whole new world. My creative side was piqued, in essence, it was, in the words of Jack Troy, “like losing a non-sexual virginity, my life was changed forever, and there is no turning back.” I immediately jumped head first into every artistic medium I could get my hands into. As time moves on, I am narrowing my focus, while still maintaining variety. My funtifyd creations will add spice to your living space! Stop by and see what funky things you can find. As well as being at the market, you can find me at the Open Air Farmers Market on Saturdays. Purchased a funktified necklace this past summer but lost the contact for the artist I think her name was Sarah-want to buy more-Can you help? That’s me!! My name is Jill and you can e-mail me or phone at 604-344-0017. Also, I am selling at the Farmers Market on Saturdays from 10:30-12:30, stop by anytime. A great selection of Original Art, Limited edition Art prints, Photo prints and Art cards by Mischa Brooks-Thoma. Commissions and Special orders welcome. Mischa Brooks-Thoma was born in Vancouver B.C. and spent all of her childhood on the Coast. She achieved a Bachelor Degree of Fine Arts at Emily Carr Institute, having experimented with a multitude of techniques; from ceramics and drawing to photography and painting. Mischa also graduated from Capilano College with a Diploma in Textiles, having studied weaving, spinning, dying, and surface design. She continues to use the knowledge gained, and her natural talent, to create unique works of art. Mischa is constantly adding to her ever expanding collection of photographs, presenting the elemental beauty found on the Pacific Coast of Canada.